Happy New Year Everyone! I wanted to start off the new year with a giveaway! Receive extra entries for sharing this image on Instagram & Pinterest. See Rafflecopter form for details. This giveaway will end 1/24/15 at 12am EST. Entrants must live in the USA, or have a USA address to ship to. All entries will be verified. You must be 18 or older to enter. Please read the rest of the terms and conditions below before entering. If you can't see the Rafflecoptor Form below, click here instead to enter. 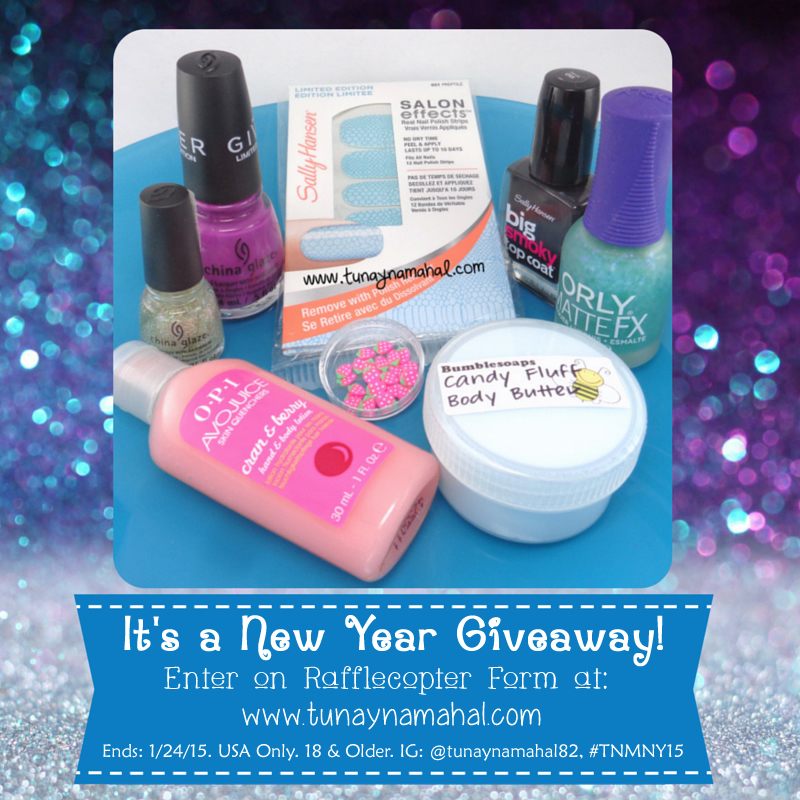 Terms and Conditions: Giveaway ends January 24th, 2015 at 12:00 am EST. You must be 18 or older to enter. Prizes purchased by: www.tunaynamahal.com. I have the right to request proof of age if it seems appropriate. Entrants must live in the USA, or have a USA address to ship to. All entries will be verified. No following and unfollowing once the giveaway ends. Prizes cannot be shipped to P.O. Boxes, APO, or FPO. There will be 1 winner chosen. Winner will be selected by Random.org and notified by email. Winner has 24 hours to respond before a new winner is selected. I may choose a new winner at my discretion for any reason. No giveaway only accounts. I will make every effort to safely package your prize, however I am not responsible for any damage that may occur during shipping. Facebook, Twitter, Bloglovin’, and Instagram are in no way associated with this giveaway. Any personal information provided will be used only for the purpose of contacting the winner.